Finding the right small car can be a challenge. Not only because small families and commuters can have many different (and contradictory) needs, but because there are so many great options on the road. In this 2019 Volkswagen Jetta vs 2019 Nissan Sentra comparison we are looking at two cars that can meet driver needs to see which one offers the most practical value. The all-new 2019 Volkswagen Jetta has a slightly higher starting price, but it also comes out of the gate with a much more powerful engine. While the 1.8-liter four-cylinder of the 2019 Nissan Sentra offers 130 horsepower and 128 pound-feet of torque, drivers can enjoy 147 horsepower and 184 pound-feet of torque with the 2019 Volkswagen Jetta. This can translate to more confidence on the road when accelerating or passing. Even better for busy commuters, the 2019 Volkswagen Jetta offers significantly better standard fuel economy. In addition to attractive engine performance and fuel efficiency, small car shoppers are also often looking for the technology features that can make the daily commute fly by safely. Bot the 2019 Volkswagen Jetta and the 2019 Nissan Sentra offer available safety features that can help drivers stay aware of changing traffic conditions, but the all-new Jetta also comes standard with practical phone connectivity features that can help drivers keep their eyes on the road. Apple CarPlay and Android Auto come standard with the Volkswagen App-Connect system even on the base S trim. In contrast, drivers will have to upgrade to the 7-inch touchscreen infotainment system on the 2019 Nissan Sentra in order to enjoy the hands-free and streamlining advantages of these apps. Even better for drivers interested in a new 2019 Volkswagen Jetta, this model comeswith a six-year/72,000-mile (whichever comes first) Limited Warranty called the Volkswagen People First Warranty. With this bumper-to-bumper transferable warranty, drivers can enjoy a new level of peace of find for years to come. The 2019 Nissan Sentra also comes with a warranty, but it covers a much shorter period and distance. 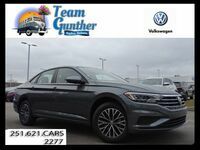 If you are intrigued by the possibilities of the all-new 2019 Volkswagen Jetta and would like to learn more about this attractive compact car in the Mobile AL area, contact a representative at Team Gunther Volkswagen today or explore our 2019 Jetta inventory in Daphne AL.